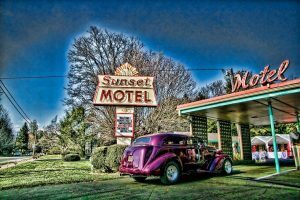 We at the Sunset Motel celebrate the best of the classic roadside motel and hotel experience. We’re the real deal: clean, comfortable rooms, friendly hometown staff, chairs outside your door so you can visit with neighbors. Enjoy your stay in a newly “retrovated” mid-century motel with modern amenities, low rates and room-front parking within walking distance to downtown Brevard. We cater to outdoor lovers and allow in-room equipment. And yes, for all you city folks, we do have free wi-fi, cable, fridge, microwave and coffee makers. Visit Brevard College, the Brevard Music Center, go biking/hiking/triking in Pisgah Forest, Dupont Forest or fly fish on the Davidson, everything is within 10 minutes of your room.